Tipsy – our 1972 fiberglass travel trailer that takes us camping and is our home away from home. The trailer above is from 1972 and we purchased it the summer of 2012. Tipsy is a Canadian made Boler travel trailer and one of our passionate hobbies. I think thus far we’ve invested far over 200 hours into it and at least 60 of those hours are sanding fiberglass, which, let me tell you, is not fun. It’s a great arm workout, but not fun. Even now, more than an handful years later, we still enjoy working on Tipsy. Below are some photos of our 1972 vintage trailer. It’s been so much work that I could fill up an entire blog about our travel trailer and instead of taking over this one, I ventured over to Tumblr and started a solely dedicated blog just to our Boler. We’ve also refinished a 17 foot one in the spring of 2017 and have another few in the shop ready to be restored. 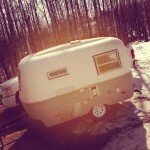 Want to follow along on our Boler journey – then check out our Instagram. Feel free to drop me a line and ask questions – people find me in odd ways, through Instagram or Pinterest to ask me about our egg. We’ve done so much from building the frame to refinishing the inside. The trailer was used as an ice-fishing hut before we got it. The trailer had holes in the bottom of it and was covered with so much spray foam insulation. Talk about another arm workout – grinding and more grinding. All in all, we’ve invested a lot of love into our 13 foot travel trailer. It’s so fun. Click below to see more and happy camping!